It's official: The NoMa name is coming to Metro. Some are making a big deal about the "new" name, but it's just one more neighborhood name on the Metro map. An article in today's Washington Post quotes several users of the stop soon-to-be formerly-known as New York Avenue. A few riders don't like the change because they think no one will know where the station is or what the name means. There may be some initial confusion, but that will pass quickly. In the debate about renaming this station, there were no easy answers. On the one hand, the two streets in the station name, New York Avenue and Florida Avenue were less than optimal because of their length. New York Avenue is over 5 miles long and crosses countless neighborhoods. A tourist looking for the Museum of Women in the Arts at 1250 New York Avenue had better not get off at the New York Avenue station, because they'd be 1.5 miles away from it. Another reason to shy away from the "New York Avenue" name is that the station of that name is not even the closest station to New York Avenue. A pedestrian would have to walk about 760 feet from the nearest entrance just to reach the street called New York Avenue. Both McPherson Square and Metro Center have entrances that are closer to New York Avenue (the street), and Mount Vernon Square isn't much further away. But on the other hand, New York Avenue is a well-known street. And the neighborhood does not have well agreed-upon name. NoMa does cover that area, but the newness of the name means many are not familiar with it. So what should the station be called? What could it reasonably be called? 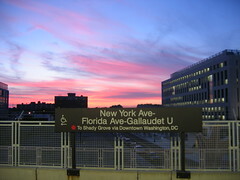 WMATA settled on NoMa-Gallaudet U. Will people be lost and confused with this name? Will we ever get used to this? As one person in the Post put it, many will be confused if they've "been riding Metro your whole life, and now [WMATA] changes a name." Metro station names often lend their names to the areas where they're located. That's certainly the case with Van Ness. Elsewhere, the stations spread the names of neighborhoods that might otherwise be unknown. Because Woodley Park is on the Metro map, many have heard of it. Glover Park is no less significant on a regional scale, but fewer people know where it is since the train doesn't go there. Some argue that NoMa is a contrived name. That's certainly the case. But it's no different than other areas in the region. One example springs to mind: Crystal City. The area in south Arlington is now known as a major office destination. Metro's Blue and Yellow trains and both VRE lines call there. Most people know where Crystal City is, probably because they've seen it on the Metro map or heard it announced by train operators. But in the early 1960s, Crystal City didn't really have a name. It was a warehouse district next to the railroad tracks. It was a lot like NoMa was two decades ago. But a condominium called Crystal House opened. After that, a few other buildings were built with "Crystal" in their name. Eventually, the area became known as Crystal City, and in 1977 a Metro stop with that name opened. But let's change history. What if that station had been called "Jefferson Davis Highway" station? What if right now, the Metro Board was debating changing the name share the contrived name of the neighborhood? Would people be arguing that the new name would confuse tourists? Would some argue that it would be better to use the name of a nearby neighborhood instead? Would others call for retaining the Jefferson Davis name simply out of momentum? Probably. But in reality, Metro put the Crystal City name on the station. And now, virtually everyone in the region finds it acceptable and knows where it is. In 20 years, (assuming the station name doesn't change again) NoMa will have even greater name-recognition than it does today. And no one will worry that visitors to the region will get lost because of the name. After all, for most out of towners, NoMa means as little to them as New York Avenue does. The new station name is more accurate and more concise than the one that has graced the station since 2004. It's not perfect, but it's an improvement.